Finally, I'm able to post this!!! After what has felt like FOREVER, it has finally arrived with Kristal (IG - tootlejayne). During the last few months I have been working on a mini quilt for my partner in the IG mini swap. I had some information from the questionnaire she filled in when signing up for the swap. 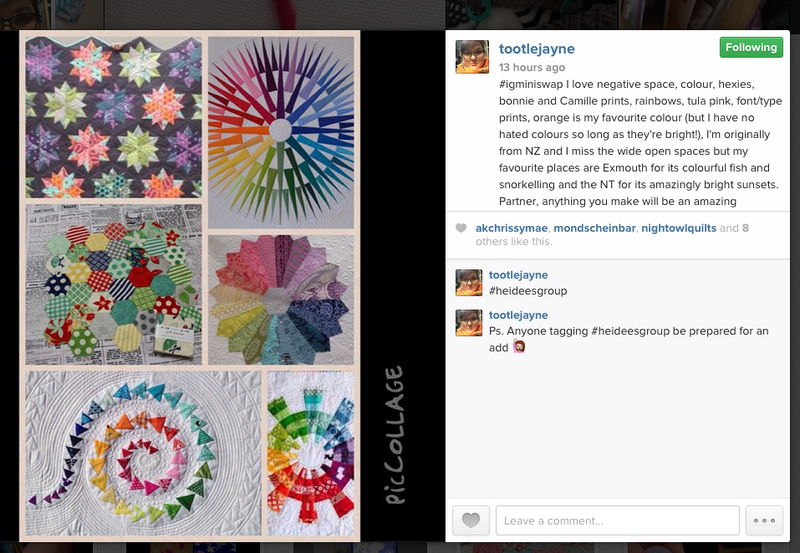 But most helpful, was her inspiration mosaics which she posted on Instagram. 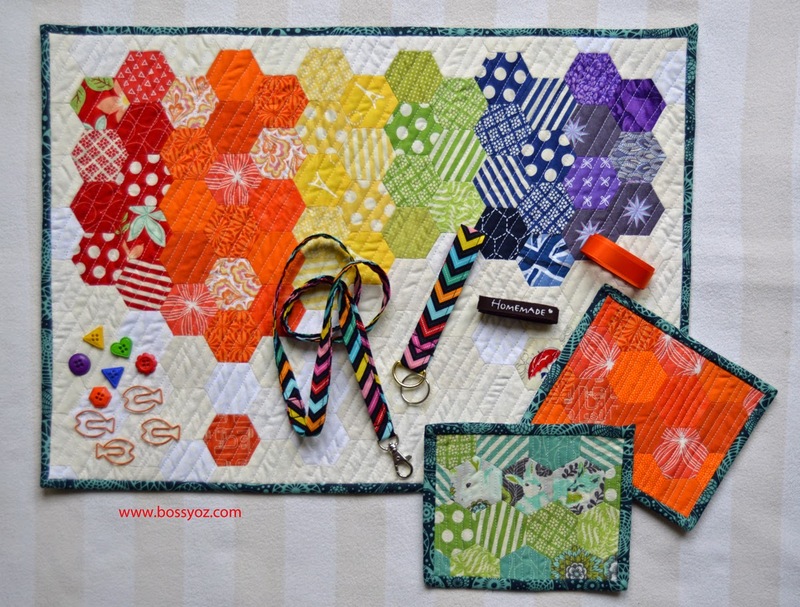 Deciding to combine all of the above, it seemed fit to do hexagons, with Bonnie and Camille plus Tula Pink fabrics, in a rainbow-ish pattern, with negative space around. GLUE BASTING, without you there would never have been a mini!!!! Having previously used thread to tack my hexagons, the glue pen was a saviour!!! 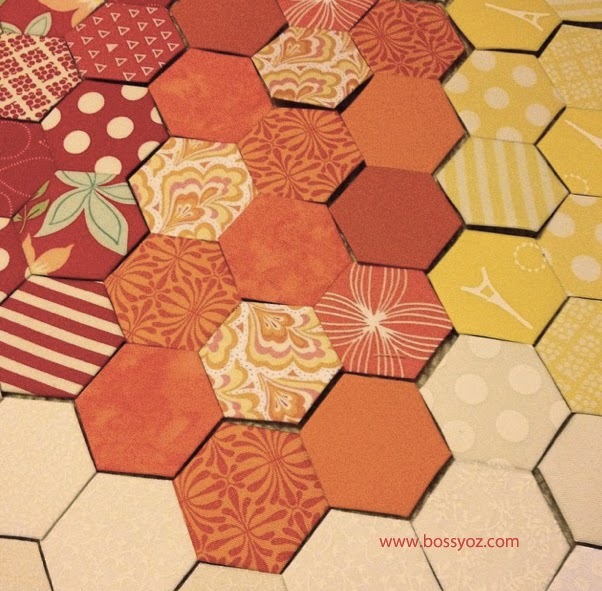 As you may see in the photos above and below, I also managed to sneak in some of Karen Lewis' screen printed fabrics. As my partner said she loves Paris, I was especially happy to find a few of those amongst the charms from Karen. Well, I hope it was the European city Paris she meant. For all I know it could have been the perfume or some American / Australian city…. For good measure, there's also a Union Jack in there. During the work, I have been posting photos of the progress on Instagram and to my HUGE DELIGHT my partner has been liking and commenting on the posts (yeah!). I believe the one where I was auditioning different bindings may have been a give-away as she recognised her likes. Oupps, and SORRY, I hope it didn't spoil it too much. So, this is what I sent off to Australia. Lovely! I harnessed the power of the glue pen for my mini too, plus my latest quilt has seen me use 4 refills!